If you are driving around Las Vegas, Nevada, and happen to be on a road with a 45 MPH speed limit, you may come across something surprising. 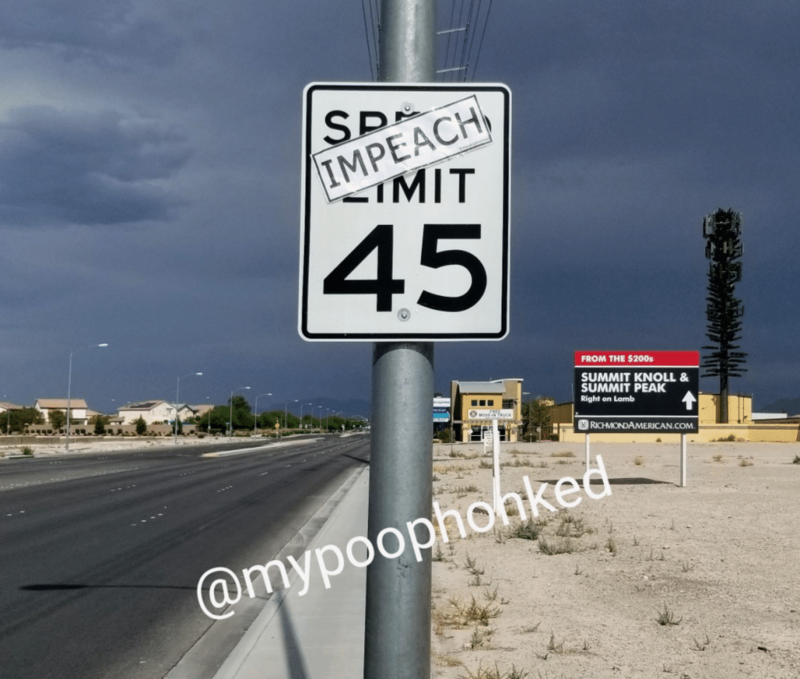 Some motorists in Vegas are noticing that those traditional signs that normally read “Speed Limit 45” now says “Impeach 45”, in protest of our 45th President, Donald Trump. On the surface this may look like a traditional act of vandalism, but in actuality there are good intentions behind this magnetic quasi-vandalism. A man who goes by the name Eric Levi, for anonymity’s sake, tells Hill Reporter that his actions are actually for a good cause. Levi sells shirts which have pictures of his signs on top of the traditional road signs for $19.99 on bonfire. They are available in five colors (grey, black, pink, orange and blue), and literally every possible size you can imagine. Certainly Levi’s practice of quasi-vandalism seems a bit iffy when it comes to legality, but he doesn’t seem all that worried. Levi tells us that his reason for putting these signs up is quite simple. He believes that President Trump is harming our nation, and that there is a strong chance that Trump will incite actual violence. The other reason that Levi continues to pursue this campaign is for the sake of Las Vegas’ homeless veterans, who he brings food, sanitary supplies and food to on his weekends. Whether or not this practice is successful isn’t in question, as photos of Levi’s magnetic sign modification have already spread across the internet at an almost record pace.